Q: What motivated you to start We Blog the World and what’s the site about? We Blog the World is all about Transformative Travel, but that doesn’t necessarily just mean on the road. The site has morphed since WBTW’s beginning – while storytelling is still at its core, its content centers around living a purposeful life and traveling from that mindset. With balance in mind, core areas of editorial focus include wellness travel, nature and adventure, luxury travel, family travel, food and wine, events and festivals and unique experiences you’d be hard pressed to find on a traditional vacation. You’ll also find travel guides on wellness, destinations and food/wine, learn about the latest in technology innovation and be introduced to the awesome stuff we try or experience, whether that be fashion, useful gear or lifestyle products that make your life a little easier or simply more fun. Q: What role do you take with We Blog the World and how has that changed from the beginning? In the beginning, I acted as an editor as I still do today, however my role has morphed and grown. Today, I manage editorial, operations, advertising, marketing and partnerships. I am also the overseer of new voices that come onto the site. Q: Who’s your ultimate reader? Our readers are looking for innovative thinking and writing, unique trips that take them on a journey not to just a destination but within themselves. Our mindful and purposeful content reflects this, from our sections on Spiritualty and Wellness to covering Spas and Retreats, Hotels that focus on health and well-being, cultural festivals, Cruises, Safaris and more. Nature is an integral part of many of our themes and features, although we do cover cultural activities in urban centers as well and have a ton of coverage on global cities. Q: What does Transformative Travel mean to you? Transformative Travel is We Blog the World’s tagline, so you’d think it has to do with what happens when you’re on a trip. Transformative Travel is as much an internal transformation as it is an external one and this can happen when you’re on the road traveling but it can also happen at home. We have so much wonder around us all the time that so often when we move around too much and can’t stay still, we miss the most precious gifts and treasures of all right in front of us. Isn’t it true that the biggest revelations and transformation we’ll ever experience in our lives are found within. I find that traveling to remote locations allows all of us the opportunity to learn more about the world around us by getting a little uncomfortable and stepping outside our comfort zone. We can then take that transformation and wisdom home with us to enlighten others. By shining our own lights, we illuminate the world around us. Q: You have six sections on spirituality and four on wellness, which is unheard of for a travel magazine. How did this come to be? When we think of wellness, we automatically think of our physical health….our bodily well-being. Few people consider mental health or emotional health and even far less, our spiritual health. I felt that we needed to address Spiritual Health as a core and integral part of leading a balanced life, whether on the road or in our own backyards at home. My aim is that our Spirituality section blows people’s lives wide open in a way that is educational, inspiring and awakening. Our wellness section is less about traditional healthcare and more about our overall well-being. Q: We Blog the World seems to have a lot of content on events and festivals. Events and festivals were core to the early days of We Blog the World. Spending over 20 years as a publicist in the technology and publishing industries, I had my fair share of attending and launching events and festivals therefore have had a lot of experience with events over the years from nearly every continent. Q: What’s your favorite way to travel and why? I love to spend time with locals although I no longer travel on a shoestring like I did in my twenties and thirties. I prefer to combine quiet off-the-beaten path places (this applies to hotels and properties as well) with getting some time with locals to better understand their culture, their land and their customs. I always try to get some time in nature which is vital to my own personal well-being and Spiritual Health. Q: How do you obtain balance in your life and what tips can you give to others? Meditative time in nature is always renewing for me, regardless of where I am in the world. I also learn from other cultures through their music and customs as well. Reflection time and sitting in silence, even if its for ten to fifteen minutes a day can be transformative. Another tip that I encourage people to do frequently, particularly in western cultures, is to take a break from your cell phone and other technologies. While technology can enable greater communication across borders, it can also be divisive and create stress and anxiety. Be sure to spend time physically with others, without a cell phone in the way of any conversation or hug. Q: You write about Spiritual Health? Why is this so important to you? Currently, loneliness may very well be the number one epidemic in the world. While people are continuing to die from cancer, heart disease and other life threatening diseases, loneliness is prolific and can eat at the core of who we are, making us depressed, mentally unwell and even dysfunctional in our day to day lives. Adding a section on Spiritual Health was one way to draw attention to its importance in our lives. Just because you don’t live in the third world or come from an impoverished background doesn’t mean your spiritual health may not be in need of attention. 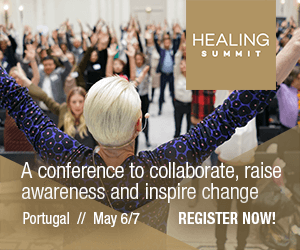 Q: What made you team up with Healing Summit as a media partner? Healing Summit is in alignment with many of my own personal beliefs. When I first came across Anne Biging’s work and Healing Summit, I was truly moved by her mission. People so often think of health and well-being in the context of a physical disease and treat the symptoms rather than the cause. This is short sighted and perpetuates a belief system that doesn’t serve our best interest. Wellness isn’t a fix that a pharma drug can do. Wellness is a state of mind and a state of being. It’s an approach to life, not something we “get.” I feel that Healing Summit is attempting to address these issues in a significant way. Q: Do you have a favorite destination and why? Natural beauty has always been high on my list and for this reason, classics like Tahiti, southern France and Hawaii are easy picks. Having grown up in the Adirondacks, I have a special place in my heart for the mountains and lakes of upstate New York and I remain a huge fan of South Africa’s Cape Province. People who have truly transformed me through their time with them have hailed from Bali, Fiji, South Africa, Nepal, Japan, Bhutan and Canada. All of these destinations are rich in nature and you sense that people feel their land is sacred, something to be treasured, adored and protected. Q: Where can people follow along and engage with WBTW? In addition to www.weblogtheworld.com where you can sign up for our weekly newsletter, we are also on Twitter @weblogtheworld and @luxuryfoodies (our sister brand), on Instagram @weblogtheworld and @luxuryfoodies, on Pinterest @weblogtheworld, on Facebook @weblogtheworld, on YouTube @weblogtheworld. You can find the We Blog the World magazine on Flipboard, as well as smaller magazines within their network on Spiritual Voices, Wellness Travel & Living and Luxury Foodies for Food/Wine lovers.